As President Obama prepares to address the nation about the militant group ISIS, the public has become more worried about Islamic extremism. Six-in-ten (62%) are very concerned about the rise of Islamic extremism around the world, which is the largest share dating back to 2007. A somewhat smaller majority (53%) is very concerned about the possibility of rising Islamic extremism in the U.S, which ties a record high. 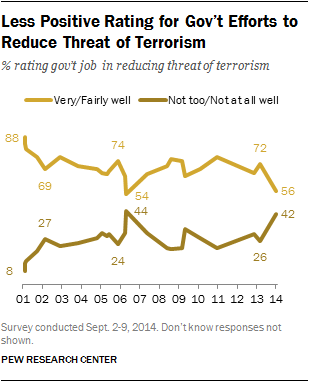 The new national survey by the Pew Research Center, conducted Sept. 2-9 among 2,002 adults, finds that ratings of the government’s job in reducing terrorism have worsened since late last year. Roughly four-in-ten (42%) say the government is doing “not too well” or “not at all well” in reducing the terror threat, up 16 points from November. While the new survey does not ask about ISIS specifically, 67% last month identified the militant group in Iraq and Syria as a “major threat” to the U.S. 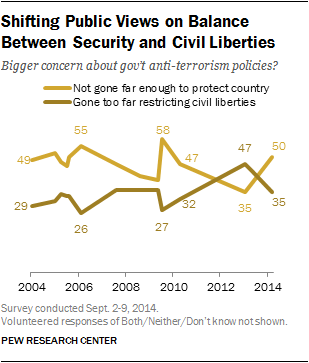 The survey also finds a shifting balance between concerns about civil liberties and protection from terrorism. In a reversal from last year after Edward Snowden’s NSA leaks, 50% today say they are more concerned that government anti-terrorism policies have not gone far enough to protect the country, while 35% are more concerned that the policies have gone too far in restricting civil liberties. In July 2013, 47% said their greater concern was that government policies had gone too far in restricting civil liberties, while fewer (35%) said their bigger concern was inadequate security. That marked the first time in nearly a decade of Pew Research Center polling that more expressed concern over civil liberties than protection against terrorism. There also has been a shift in views about whether Islam is more likely than other religions to encourage violence among its followers. Currently, 50% say Islam is more likely to encourage violence among its followers, while 39% say it is not more likely to encourage violence. Opinion about whether Islam is more likely to encourage violence has fluctuated over the years, but as recently as mid-July, the public was divided (43% more likely to encourage violence vs. 44% not more likely). 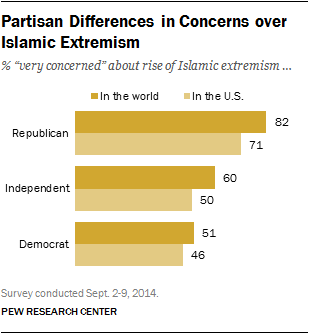 Looking both domestically and internationally, Republicans are more concerned than Democrats about the rise of Islamic extremism. About eight-in-ten Republicans (82%) are very concerned when it comes to Islamic extremism in the world and 71% are very concerned about the U.S. specifically; among Democrats, about half (51%) are very concerned internationally and 46% nationally. Concern about rising Islamic extremism in the world (62% very concerned) is 25 points higher than it was in July 2011 and 13 points higher than in November 2009, shortly after the Ft. Hood shootings. 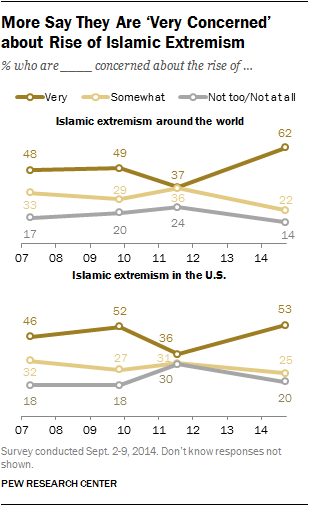 Concern about extremism in the U.S. (53% very concerned) is 17 points higher than three years ago, but similar to 2009 (52%), after the Ft. Hood incident. Both Republicans and Democrats register a much greater level of concern than they did three years ago. 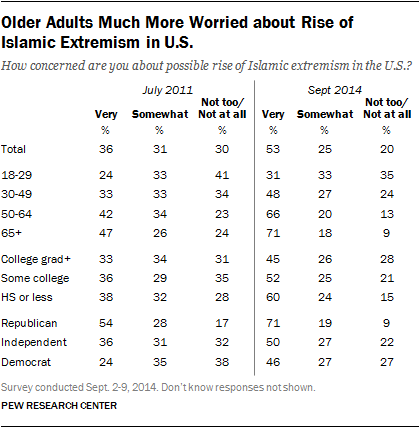 Worries about Islamic extremism in the U.S. especially have grown among older adults. Two-thirds of adults ages 50-64 (66%) and about seven-in-ten of those 65 and older (71%) are very concerned about Islamic extremism domestically, up about 25 points from 2011. At the same time, there has been a substantial drop in the public’s ratings of the government’s efforts to reduce terrorism. Though a 56% majority says the government is doing very well or fairly well, this is a 16-point decline from last November. About four-in-ten (42%) say the government is doing not too well or not at all well, which nears the post-9/11 high of 44% in early 2007. Republican dissatisfaction has nearly doubled since last fall, from 30% then to 58% today saying the government is not doing a good job. Since last year, the share of Democrats saying this has increased only modestly, from 20% to 26%. During the Obama era, Republicans consistently have given lower marks than Democrats to the government’s anti-terrorism efforts. 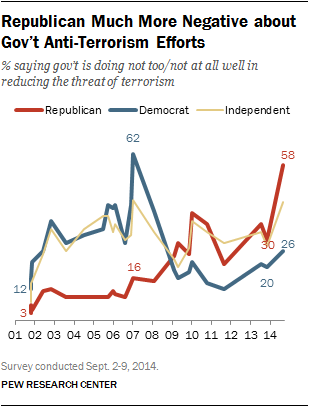 However, the partisan gap was even greater (and in the opposite direction) late in George W. Bush’s tenure; in 2007, 62% of Democrats rated the government’s job in the reducing terrorism as not good, compared with just 16% of Republicans. In addition, a growing share of the public expresses concerns that the government’s anti-terrorism policies have not gone far enough to adequately protect the country (50%) rather than going too far in restricting the average person’s civil liberties (35%). This is a shift from when this question was asked last year after revelations about the NSA’s domestic surveillance program. Pluralities then said they were more concerned that the government had gone too far (47% in July and 44% in November). Today, the balance of opinion is similar to the public’s views in late 2010. Last November, partisans on both sides were roughly divided on the balance between protection and civil liberties, but that is not the case today. 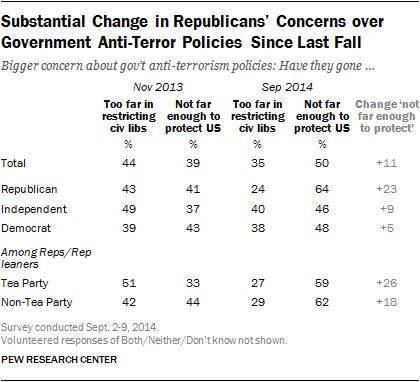 Concerns that anti-terrorism policies haven’t gone far enough have increased 23 points among Republicans to 64%; among Tea Party Republicans, 59% say this, up 26 points. Meanwhile, there has been no significant Democratic shift (48% today vs. 43% in November). But the party remains internally divided; 46% of liberal Democrats are more concerned about the government going too far in restricting civil liberties, compared with 32% of conservative and moderate Democrats. An increasing share of the public believes that Islam is more likely than other religions to encourage violence among its believers, reaching a high since 2002. 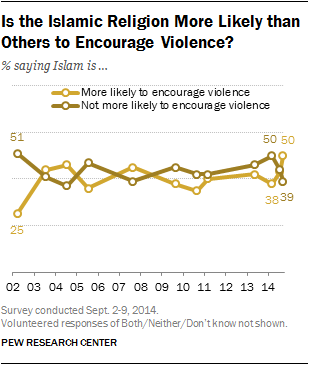 Currently, 50% say Islam encourages violence more than other religions, up from 43% in July and 38% in February. Republicans continue to be more likely than Democrats to say Islam encourages violence more than other religions. But increasing shares of both parties express this view. Among Republicans, two-thirds (67%) say Islam is more likely to encourage violence — up 13 points since February; just 23% say Islam does not encourage violence more than others. About four-in-ten Democrats (42%) say Islam is more likely to encourage violence — up 14 points — while 48% say it is not more likely. Internally, there are divisions within both parties. Conservative Republicans are 20 points more likely than moderates and liberals to say Islam encourages violence more than others (72% vs. 52%). And more conservative and moderate Democrats say this than do liberal Democrats (46% vs. 35%). Just 33% of those under 30 say Islam encourages violence more than other religions and this sentiment has remained roughly constant over the past year. Older adults, however, are increasingly likely to say that Islam encourages violence. Fully 64% of adults 65 and older say this, an increase of 18 points since February. Seven-in-ten white evangelical Protestants say Islam encourages violence more than other religions, the highest percentage of any religious group. Among the religiously unaffiliated, just 35% say Islam is more likely to encourage violence among its believers.